Luden's Cough Drops only $0.50 at Dollar Tree! 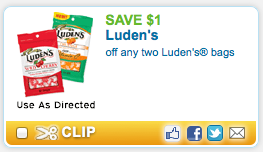 Many Dollar Trees carry bags of Luden's Cough Drops. Use this $1 off 2 coupon to get them for $0.50 each! NOTE: Use zip code 77477, under Health Care if you can't find the coupon. To change the zip code, click on Local Coupons, enter the zip code, and then click on Coupons again.